At Quest Diagnostics, we believe that serving the interest of our shareholders and those of the community at large are not mutually exclusive. In fact, doing what's right for the community is often in the best interest of our bottom line. 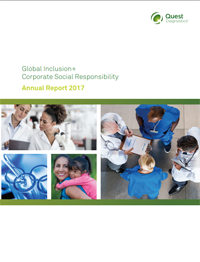 Our 2017 Global Inclusion & Corporate Social Responsibility Report shows the progress we are making.